Napa has about as much to do with chocolate as Greenwich, CT -- home to famed entertainers, all-star athletes & superclass hedge fund managers -- does low-income housing (fortunately for them, food stamps & subsidies -- the 1%'s contribution to offsetting unlivable wages -- keeps most people in the Bronx). Both Greenwich & the Bronx draft off the other to their own benefit (e.g., subprime mortgages). Oh, yeah, right, k, got it... wine-infused chocolate. Like drinking & driving, a perilous idea, that often winds up in a dead-end of clash-crash mashups; an accident that already happened. But exploration is hard-wired in the DNA so for those who insist to scratch the itch, forget fear & uploading logarithms, charts, classifications, spider-graphs & more guidelines on the latest app that juxtapose flavor combinations for the "perfect match". They rarely work -- for dating or food; leading mostly to "appathy". Just go ahead, develop an instinctive sense for what succeeds or, more likely, fails. And remember, even while in a coma, seriously bad choices can lead to a "teachable moment". Here's to a happy accident. Bon appetite et bon voyage. Autopsy brain-scan after Napa Chocolate by Van Leer? Van Leer owner Barry Calebaut claims "fine Ghana origin". Re: luxury Toyota... bulk-grade cocoa married to bulk grape vino. Neither stand much of a chance on their own. Together, however, they tell a different story. Wine gives it more than just a little color alone; it interlines the chocolate so that the duo galvanize those smoke notes at the finale, a combination roast (cocoa) / ferment (alcohol). And just a drop or two (virtually homeopathic) to keep this kid-legal. That's what makes it work. Higher levels of spirit could've amplified the heat. 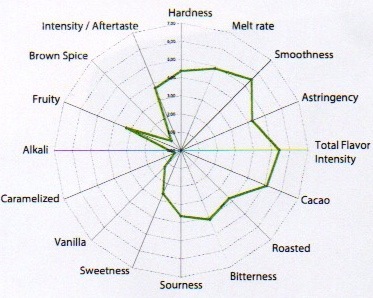 Sure, the mid-point undergoes some friction but cocoa butter mediates & 35% sugar rushes in to counteract technical flaws (over-roasting; strip conching) & any uncomplimentary flavors. As oenophiles wuv to say, 'felicitous'.